Your home’s front door is your home’s first impression. And according to a new report by real estate search site Zillow’s 2018 Paint Color Analysis, home buyers will pay extra bucks for homes with black or charcoal gray front doors. Take a look at what your front door is saying- is it time for a front door replacement? The report released by the national real estate company took a look at more than 135,000 photos from sold homes around the country to see how certain paint colors impact their sale price on average when compared to similar homes. The report showed that homes with black or charcoal gray front doors sell for $6,271 more than expected. That’s a super easy and economical way to open the door to more bucks. “For a seller, painting a front door is one the least expensive home prep projects, but also one that can have a powerful impact on a home’s sale price,” says Kerrie Kelly, Zillow home design expert. Other color choices that could mean more green for homeowners was a periwinkle blue bathroom which added $2,786 to the bottom line; kitchens with dark lower cabinets paired with lighter upper ones sold for $1,547 more and living rooms with warm tan walls garnered $2,793 more money for the seller. Painting a front door will take some elbow grease and you need to make sure you are starting with a front door that is not damaged by weather or compromised. Painting an ill-fitting door will only mask larger front door issues. If your door is warped, has water damage, insect damage or your door has lost its R-Value (energy efficiency), it is time for a front door replacement project. A front door that looks weathered or worn is not only unappealing curbside, it also can be a drain on your home’s heating and cooling resources. There are plenty of options when it comes to replacing your front door. The material, door hardware, and decorative accents and installation all impact the cost for a front door replacement. 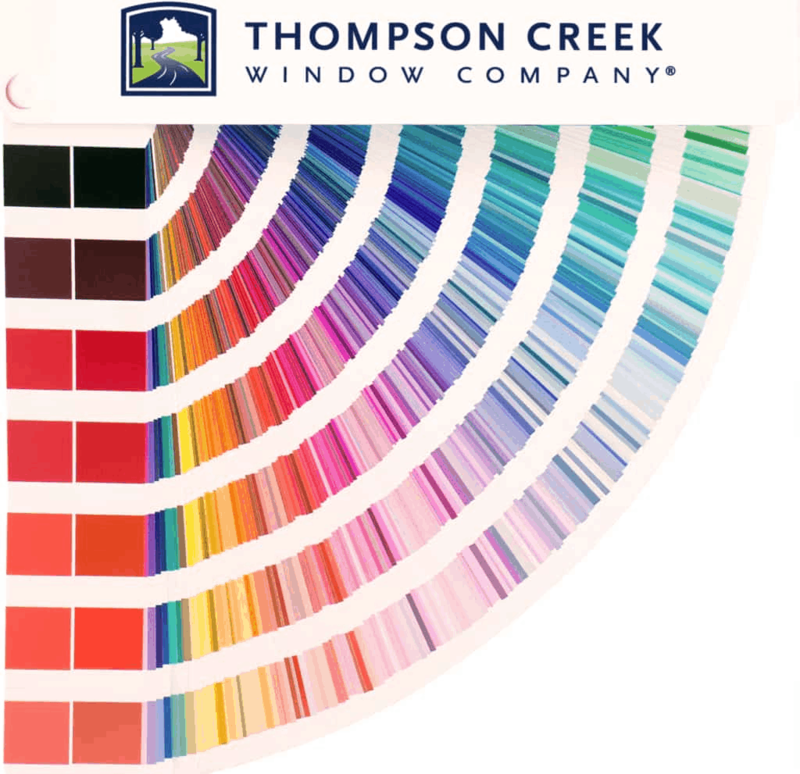 At Thompson Creek all the doors we manufacture and install are energy efficient which will help lower your utility bills and maintain a comfortable temperature inside your home all year long, all while offering the security you expect from a front door. You can choose from coal black, sterling gray or find a Sherwin Williams color for Thompson Creek to custom match to stay on-trend. If a black front door is not your style, Thompson Creek has fiberglass and textured steel stains as well as cherry, mahogany, oak and fir stain options. 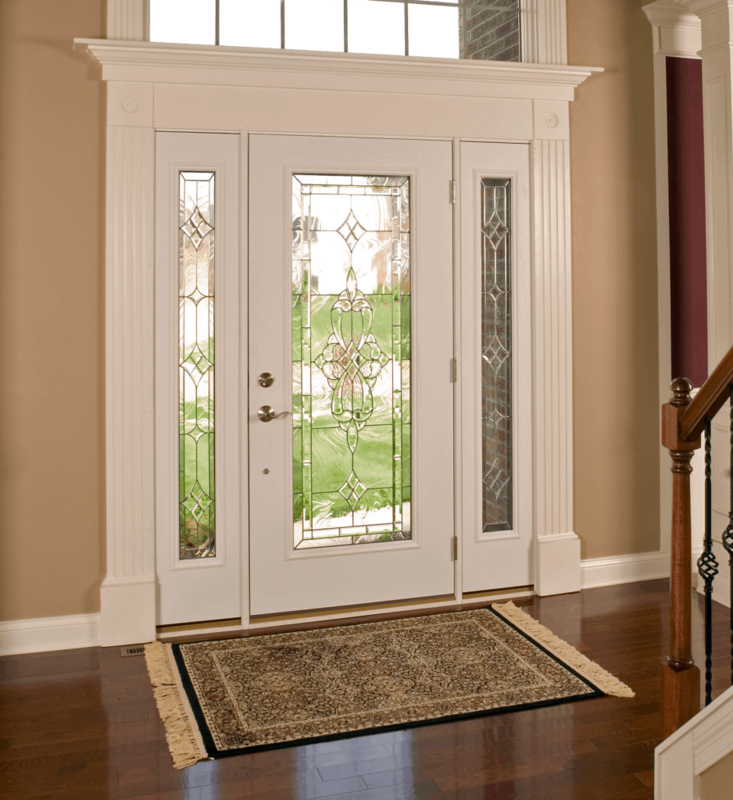 You can add some personality to your front door by choosing side panel patterns, sidelights, transoms or glass panels. Whether you choose to go with the latest real estate color trend or you add your own front door flair, a properly working and clean front door is one of the quickest investments to make a big impact on your home’s curb appeal. A good looking front entry anchored by a stylish and functional front door is welcoming to your guests with or without the mat that says so.